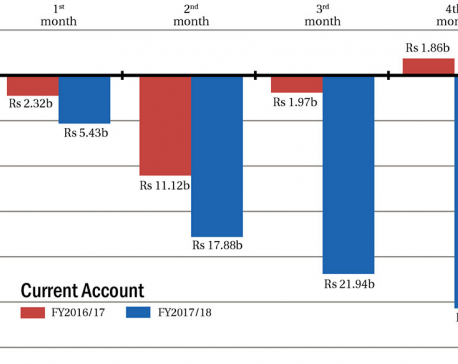 KATHMANDU, June 11: ​Sharp rise in import bills has pushed the current account deficit to a new low in the tenth month of the current Fiscal Year 2017/18. Current accounts, which measures country's transactions with the rest of the world, slipped to Rs 191 billion in the 10th month – Rs 20 billion more than what was recorded in the 9th month. The rise of imports is mainly driven by remittance-fueled consumption and also due to sure in import of construction materials and equipments for development and reconstruction works. The, however, latter is taken as a positive indicator in the economy. 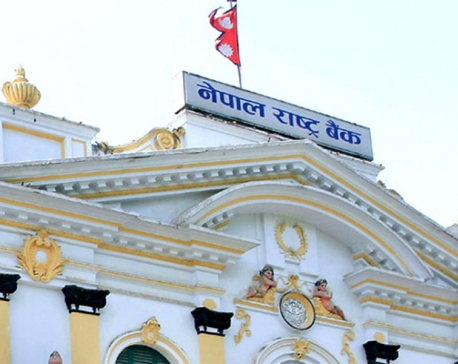 “Current account deficit widened further to Rs 191 billion on account of elevated level of imports,” states Macroeconomic and Financial Situation Report of 10 months of Fiscal Year 2017/18 issued on Sunday by the Nepal Rastra Bank. 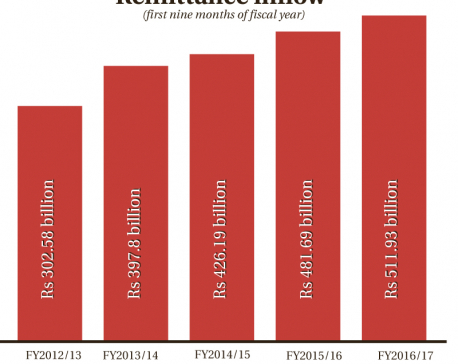 “As a result, the overall Balance of Payment (BoP) turned into a deficit of Rs 18.93 billion over the first 10 months of FY2017/18 in contrast to a surplus of Rs. 53.81 billion in the same period of the last fiscal year. The country imported goods and services worth Rs 985 billion in the first ten months of the current fiscal year – a rise of 21.9 percent compared to import figures in the same period of FY2016/17. Trade deficit in the 10 months of the current fiscal year stands at Rs 919 billion. The trade deficit figures of the first 10 months of FY2017/18 had surpassed the annual deficit of Rs 917 billion in FY2016/17. The workers' remittance, which was posting either negative growth or a slim growth in recent months, posted a resilient growth of 7 percent to Rs 606.68 billion in the first 10 months of FY2017/18. Such growth in the review period in the last fiscal year was 5.2 percent. Despite bleak import figures, the treasury has foreign currency reserves worth Rs 1072 billion which is sufficient to cover import of goods and services for 9.6 months, according to the report. Head of the Research Department of NRB, Nara Bahadur Thapa, said that current account deficit is natural as the country is dependent on import-based consumption supported by workers' remittances. “There is also a positive side as we can see increased imports of construction materials and equipment because of reconstruction works,” added Thapa. To contain rising imports of consumable goods as well as construction materials, the government, through the budget unveiled two weeks ago, announced that it would work toward making the country self-sufficient on agro products in three years Likewise, it has also announced special protection programs for manufacturers of sugar, medicine, steel rods and cement, among others, to make the country self reliant on these products. Meanwhile, foreign direct investment (FDI) flow increased to Rs 15.51 billion over the review period compared to Rs 11.61 billion in the first 10 months of FY2016/17.